In a world dominated by built-in distractions, constant interruptions, and ever-shifting priorities, it's absolutely critical to capture every important piece of information you can focus your attention on in the moment that it has your attention. Here are two can't-miss ways to use your smartphone to grab the essential data and ideas that float through your brain or bubble up in a conversation by the water cooler. It's important to bear in mind that what we're talking about here is ephemera. What makes any given nugget of information essential is entirely a matter of personal and professional priorites. Often, we don't even recognize how important a short email, a phone number scrawled on a paper napkin, or a vague five-word concept for a new product actually is until we've distanced ourselves from the fleeting first encounter with it and allowed our minds to build context around it. But if we've failed to accurately and reliably capture that idea in the moment that it presented itself, we may never get the opportunity to give it its day in the sun. The aim here is not to completely sort and process the stuff you collect. That's something you can do later, according to your own productivity routine. The tools and practices discussed in this post are simply supposed to help you get important stuff into your system so you can deal with it appropriately when the time comes. Easily half of the important stuff that comes to my attention does so while I'm away from a computer, I don't have a pen handy, and I'm holding a cup of coffee in one hand. The one thing I'm almost never more than a few feet away from is my phone, so I use it. With one hand, I can quickly get the phone out of my pocket, launch a capture app, and speak a voice memo to lock in whatever fleeting thought I need to capture. 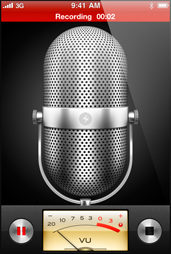 iPhone Voice Memo can quickly capture a passing thought so you can send it to your inbox. Android phones with Google voice recognition have the clear edge here. With my Droid, I can launch the Remember the Milk app (my favorite for managing to-do lists), speak a message, let Google's voice recognition record it into RTM, and slip the phone back into my pocket within a few seconds. By comparison, the iPhone is weak here, but it can still do more or less the same thing, albeit with a few extra steps. Apple's Voice Memo app can quickly record my thoughts and let me send them to my inbox via e-mail. Better still, the Dragon Dictation app can turn my speech into text that I can copy and paste into a more appropriate app when I have a free moment later on. In either case, I can enjoy the luxury of knowing that whatever pressing thought I had has been saved to memory so I can act on it confidently when the time comes. Capturing text-whether it's a handwritten note, a paper receipt, or a whiteboard full of scribbled thoughts-is easy with a smartphone camera. Almost everyone I know does this from time to time. But to make that picture useful, you'll want an extra app that can read the text and make it searchable. Evernote can make the text in your pictures searchable. My favorite mobile app for capturing text is Evernote, which also can grab audio notes in much the same way Apple's Voice Memo app can. For written notes, though, Evernote is almost unbeatable. You can take a snapshot from within the app on Android, iPhone, BlackBerry, Windows Mobile, or a Palm Pre. You can also import a shot from your phone's camera roll. 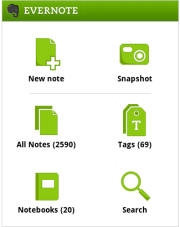 Once you sync a photo from your phone to your Evernote account, it becomes searchable. And it's amazing how good Evernote's handwriting recognition is at picking actual words out of sloppy chicken scratch. The tools are the easy part, of course. That's what makes them good tools. The tricky part is training yourself to distinguish good, action-worthy data from mere noise. For my part (and I'm constantly learning here), I can often spot a keeper data point (for that's what these little tidbits of information are, after all) by my own reaction to it, as a little voice in the back of my mind quietly whispers "huh?" or "ah-hah." When I catch that little internal trigger, I move quickly to capture the data. Got your own tricks for capturing important data with your phone? Share them in the comments.